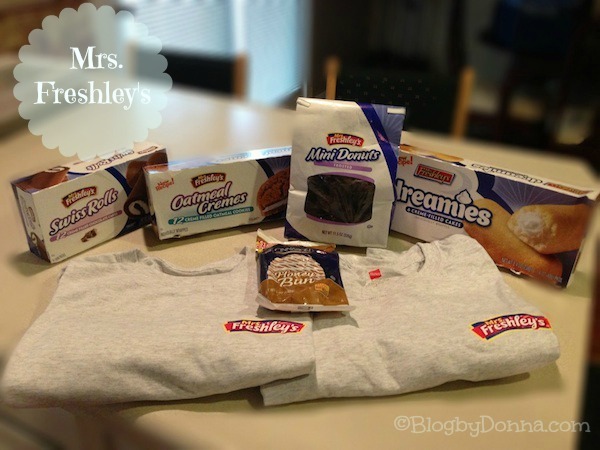 This delicious snack filled post has been brought to you by Mrs. Freshley’s…. I love snacking. It’s a weakness of mine. Well, I say weakness, but I count calories and as long as a snack fits into my daily calorie intake for the day, I’m good. And so are Mrs. Freshley’s Snack Cakes. I recently received several different Mrs. Freshley’s Snack Cakes to try, and the first thing I can say about them is, “They are so fresh”. They tasted like they were just made that day, fresh. The Cinnabon Honey Bun (warmed in the microwave for 20 seconds) was…. heavenly. I did reluctantly share the Honey Bun with my husband. Sigh. I’m a big fan of Swiss Rolls, too, so giving up half my Cinnabon wasn’t quite so painful. The trouble with the Swiss Rolls is they’re my son’s favorite. So here I go having to share them, too. I was thrilled that my husband and son didn’t realize how good the Oatmeal Creme cakes were, so I didn’t have to share them…. at first. When they finished up the Swiss Rolls and the Chocolate Mini Donuts (yep, they loved them, as well), they came after MY Oatmeal Creme Cakes. Dang them. The Oatmeal Creme Cakes were extremely fresh. Seriously fresh. I was so impressed with the freshness. I’m not a huge fan of the dreamies, but my husband and son don’t seem too sad about it. I swear they’re snack hogs. 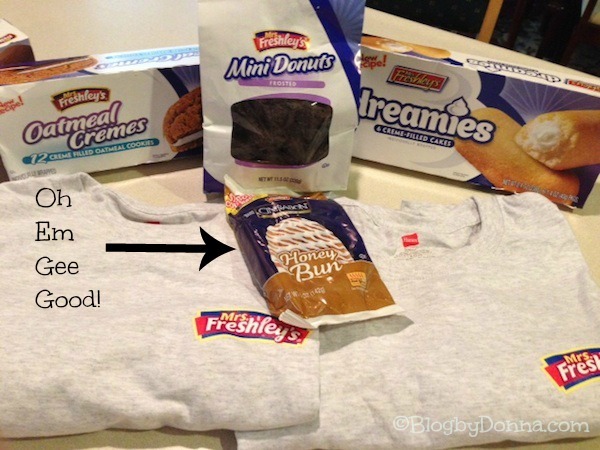 I also received two Mrs. Freshley’s T-Shirts. I so love tees. If you see me out in it, be sure to let me know you love Mrs. Freshley’s, too! You can find Mrs. Freshley’s delicious snack cakes and pastries in mass merchandisers, retail grocery stores, convenience stores, and vending machines across the United States. Be sure to “like” Mrs. Freshley’s on Facebook. I have great news for one lucky Blog by Donna reader! Mrs. Freshley’s is going to give YOU $50 worth of Mrs. Freshley’s coupons! That’s a LOT of yummy snack cakes! Open to U.S. residents only 18+ of age. Terms & Conditions are on the Rafflecopter form. Ends 8/31. Disclosure: I was provided with the Mrs. Freshley’s snack pack mentioned in this post for review purposes. All opinions are 100% mine and may differ from yours. I will only endorse companies, products, and services that I believe based on my own experiences, are worthy of endorsement. I would love to try the mini donuts! Wow, I love that they have Cinnabon Honey Buns! I think all of them would work! I am a bit partial to chocolate, though. Oh yum – I love mini donuts!! I’d like the mini donuts. Thanks! The oatmeal creams look devine! I am most interested in the dreamies because of their similarity to a much more expensive brand. I really like oatmeal creme cookies! I love swiss cake rolls, honey buns, and those dreamies sound pretty good too!